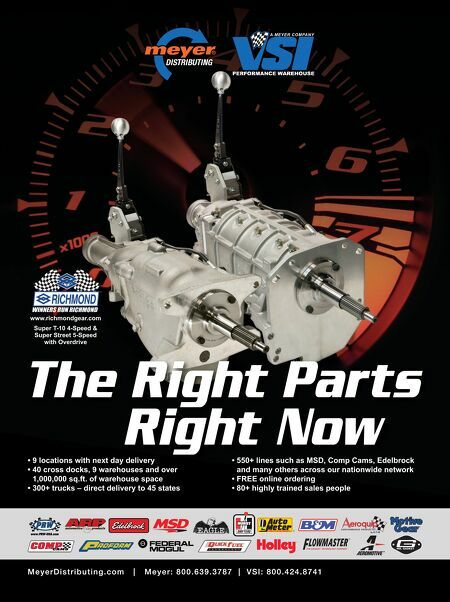 112 n Performance & Hotrod Business n January 2015 ONE MORE THING... I f you've ever wondered about a way to determine the best the Pro-Touring movement has to offer, the OPTIMA Ultimate Street Car Invitational offers a chance to find out. The series featured expanded regional events this year leading up to a final in Las Vegas, where more than 100 drivers participated in two days of competition and challenges, from the road course to city streets to the skidpad. Danny Popp, driving a 2003 Chevrolet Corvette Z06, was the overall winner. "It's been incredible to drive on the most historic tracks during the 2014 season," said Popp. "We will definitely be back next year." Popp, who also won the OPTIMA Ultimate Street Car Invitational in 2011, earned the hard-fought victory by less than one point over Brandon Ranvek and his 2006 Mitsubishi Evo. Betim Berisha took third overall driving a 2011 Porsche 911TT. A total of 103 vehicles competed in the event, held for the first time at Las Vegas Motor Speedway over the weekend of Nov. 8-9. They faced a series of competitive driving events over the weekend, including the Wilwood Speed Stop Challenge and the RideTech Street Challenge Autocross on Saturday. Later that eve- ning, competitors faced public roads on the Detroit Speed Road Rally Challenge, which ended with the Showtime Motorsports participant reception at the new Shelby American headquarters. The high-speed BFGoodrich Hot Lap Challenge took place on the 2.4-mile road course all day Sunday. The road course action was paced by the Red Line Oil Camaro, which set a baseline lap time for all the competitors to challenge. Each vehicle's overall quality and craftsmanship was reviewed by judges during the Lingenfelter Performance and Design Challenge, which required two days to complete. A crowd estimated at over 1,000 enjoyed the competition, as well as the manufacturer's midway featuring a wide range of performance industry parts makers. Individual category winners were: Wilwood Speed Stop Challenge • First Place: 2006 Mitsubishi Evo RS (Brandon Ranvek) • Second Place: 2011 Porsche 911TT (Betim Berisha) • Third Place: 2012 Porsche 911 Turbo S (Larry Woo) RideTech Street Challenge Autocross • First place: 2006 Mitsubishi Evo RS (Brandon Ranvek) • Second place: 2003 Chevrolet Corvette Z06 (Danny Popp) • Third place: 1965 Chevrolet Corvette (Brian Hobaugh) BFGoodrich Hot Lap Challenge • First place: 2003 Chevrolet Corvette Z06 (Danny Popp) • Second place: 2010 Chevy Camaro (Ryan Mathews) • Third place: 2013 Chevrolet Camaro (Bryan Johnson) Lingenfelter Performance and Design Challenge • First place: 1964 Buick Riviera (JF Launier) • Second place: 1959 Chevrolet Corvette (Alan Palmer) • Third place: 1964 Chevrolet Corvette (Dan Livezey) Sponsors included K&N Filters, BFGoodrich, Detroit Speed, Lingenfelter Performance Engineering, RideTech, Wilwood Disc Brakes, Snap-on Tools, Jet-Hot Coatings, Red Line Oil, Showtime Motorsports and the MAVTV Network. 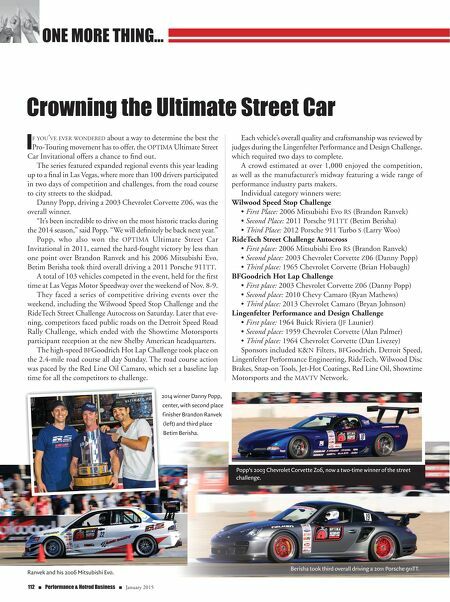 Crowning the Ultimate Street Car Popp's 2003 Chevrolet Corvette Z06, now a two-time winner of the street challenge. 2014 winner Danny Popp, center, with second place finisher Brandon Ranvek (left) and third place Betim Berisha. Berisha took third overall driving a 2011 Porsche 911TT. Ranvek and his 2006 Mitsubishi Evo.